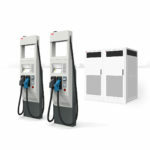 The SAE International committee overseeing electric car charging (J1772) has finally released its standard for fast charging electric cars, and the standard promises to simplify the life of future electric car owners by slashing recharging time. One of the long running debates in electric cars is what will be the best method to speed up recharging time. 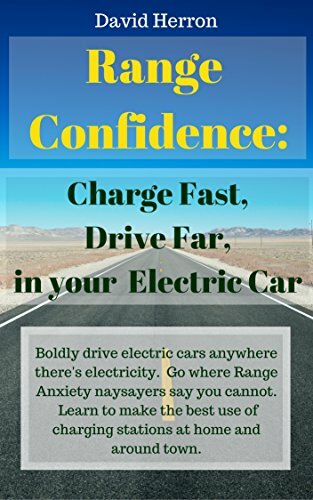 Recharge times longer than a few minutes are widely thought to be unacceptable, to a population that is accustomed to the five minutes or so it takes to refuel a gasoline powered car. 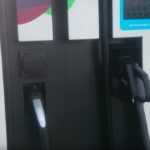 SAE International, the standards organization that gave us the J1772 standard for electric car charging, has announced on Monday a new version of the standard which supports high speed electric car charging, that could support a 20 minute recharge time for a typical electric car given the right equipment. The standard has been a long time coming. 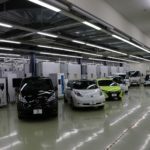 In its development the SAE standards body ignored a perfectly good existing standard, CHADEMO, that has been in use for years and is already available in the Mitsubishi i-MiEV and Nissan Leaf. In the meantime other non-standards for fast charging electric cars have been developed. The most prominent of these is the Tesla Motors Supercharger present on the Model S, an electric car that can be driven for 260 miles or so and then completely recharge in under an hour. Renault just unveiled the Renault ZOE whose Caméléon charging system supports charging rates up to 43 kilowatt three phase AC with a 30 minute recharge time. The new ‘Combo’ plug for the J1772 standard is meant for use with ‘DC Level 1’ and ‘DC Level 2’ charging stations. These parallel the AC Level 1 and AC Level 2 charging levels electric car owners are already familiar with. AC Level 1 is the 120 volt 13 or 16 amp charge rate that results in a 20 hour recharge time for a typical electric car. AC Level 2 is the rate accessed through a regular charging station, and uses single phase AC at 208-240 volts and typically at 30 amps. 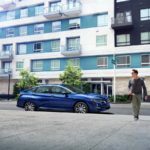 While this level is theoretically capable of 19 kilowatt charge rates, the current implementations are for a 6.6 kilowatt charge rate that gives a full recharge time of 3.5 hours. At the full 19 kilowatt rate recharge time would be 1.2 hours or so. DC Level 1 is specified for 200-500 volts DC (depending on battery pack voltage) and a charge rate up to 80 amps, or 40 kilowatts, and provides a full recharge time of 1.2 hours. DC Level 2 also covers 200-500 volts DC, up to 100 kilowatts (200 amps), and provides a full recharge time of 20 minutes. These recharge times are based on a 25 kilowatt-hour battery pack, which is the size of the Nissan Leaf or Ford Focus Electric battery pack. Larger batter packs would require longer recharge times. While the AC Level 2 charging stations are relatively compact, those for DC Fast Charging are the size of a large refrigerator. The system works by moving the AC to DC voltage conversion to an external unit, which is housed in that refrigerator-sized box. In every case, recharging an electric car involves converting AC to DC voltage, because battery packs work on DC voltage. The Renault ZOE supports a 43 kilowatt AC charging rate without requiring a large external unit for AC to DC conversion. Many electric vehicle advocates have been anxious over the deployment of DC Fast Charging. The fast recharge time would mean erasing one of the acceptance hurdles against electric cars, by reducing the recharging time from hours to a half an hour. 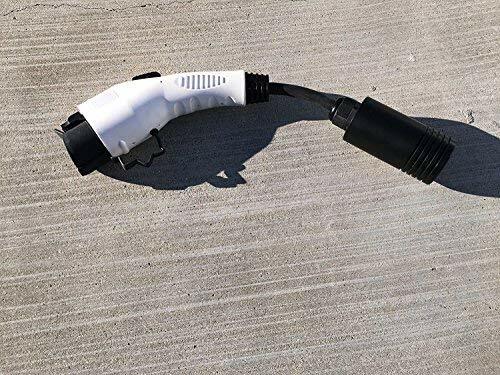 The problem is that the CHADEMO standard has been available in cars for years, and has an installed base that’s growing every day, while the SAE DC Fast Charge system will not be shipping until at least the 2013 and maybe 2014 model years. 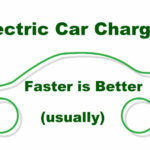 How much of the slow uptake of electric cars is due to the slow recharge time? Another concern is the upgrade or replacement path from the CHADEMO fast charging standard to the new SAE DC Fast Charge standard. The existing cars with CHADEMO charging outlets cannot be upgraded to the new SAE standard. 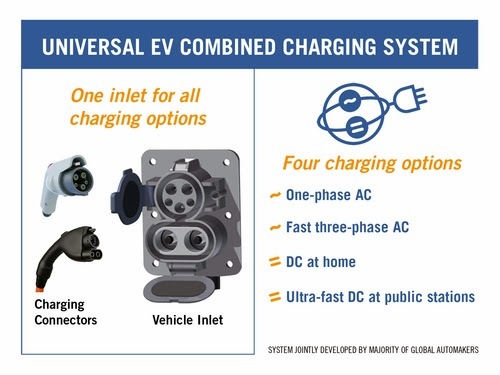 On the other hand, some charging station manufacturers (ABB, Schneider) are making DC Fast Charge stations that support both the CHADEMO and the SAE standards. The SAE DC Fast Charging standard was developed by a consortium of major automakers that did not include Renault, Nissan nor Mitsubishi. Many describe the dueling standards as the Japanese versus the Germans, and at times Nissan and GM representatives have traded verbal punches. 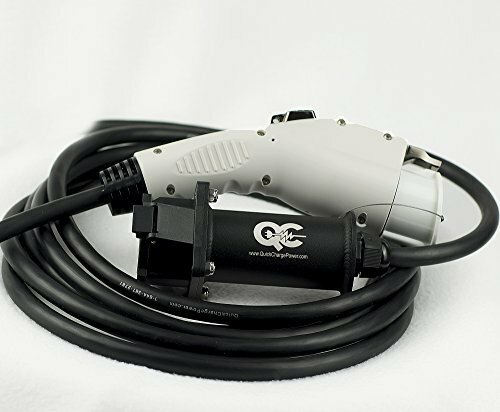 By the time any car sporting the SAE Combo Plug makes it to market, there will be 10’s of thousands of electric cars with CHADEMO socket, perhaps 20,000 Tesla Model S’s with the Supercharger socket, and some number of Renault ZOE’s supporting a 43 kilowatt AC charging rate. This means the SAE’s system is going to face a stiff headwind in market adoption, depending on the level of effort contributed by the automakers who support that standard.